Do you live in Grand Forks, N.D.? Do you know anyone who does? 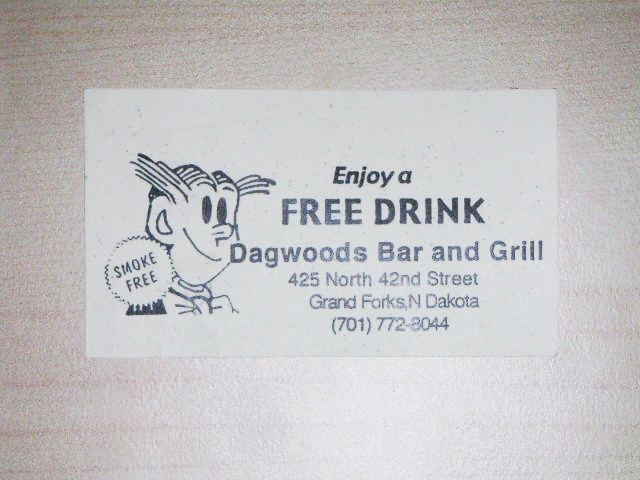 I found this free drink card on the sidewalk this morning and it seems an absolute shame for it to go to waste. I'm almost inclined to drive up there myself. If you know anyone who could make use of this card e-mail me. I love this free drink card so very much. I love the wording, with its gentle invitation to 'enjoy' your free drink rather than just knock it back as the unthinking prelude to a hideous night of debauched revelry and, ultimately, regurgitation. I love the bizarre monkey/bartender with his trusting smile and quirkily-Brylcreamed hairdo. 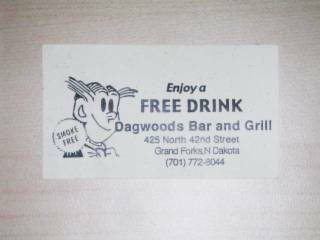 Dagwoods Bar and Grill wants nothing from you! It just wants you to enjoy a free drink, no strings attached. Why has no one claimed this card? WHY? And why the hell don't I live in Grand Forks? I, too, am shocked and disturbed that this card has hitherto gone unclaimed. I thought for sure my inbox would be flooded by eager Grand Forksians. Yet the card remains on my desk -- right next to my flask, underneath my baseball cap. Surely it won't stay there too much longer?